Before I get into this post... I have a confession... I kill plants. I know...sad. I really don't know what's wrong with me. I love plants. I water them. I enjoy them in my house. I give them sunlight...DEAD. I can't explain it. 1] Most of them were worked in some sort of K2, P1 pattern. I found it easier this way (as opposed to P2, K1 - this is just a preference). I would make them and then turn them inside out depending on how I wanted them to look. 2] I stuffed my cacti with polyfil stuffing and put them into small terra cotta pots that I spray painted with a textured paint. 3] The flat cactus was created with a K1,P1 (around) pattern on odd rows and a P1,K1(around) pattern on the even rows. This gave it little "bumps". I put this one in a small pot and surrounded it with little stones (from the craft store). 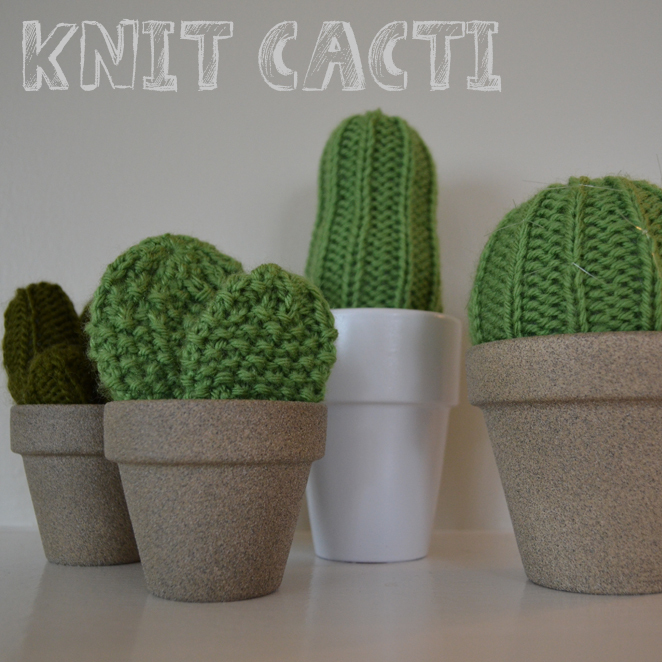 There are so many ways you can create knit cacti. There really is no right or wrong way to do it. I really like having them around the house because I know, no matter way, I will NOT kill them. What an adorable idea!!! I don't knit but could probably fashion this together out of old sweaters!?! Thanks for stopping by Kelly. What a great idea! Not a knitter but definitely a plant killer. I'm glad I'm not the only one :) Have a great weekend! Oh my, I LOVE this!! I, too, tend to kill plants :( So I guess I need to learn to knit so I can have these beauties around my house :) Have a lovely weekend! Hi Shannon, my daughter has the same capacity of you:) I think this is the best solution, I'm going to adopt it to her! Now your beautiful cactus are forever green! Thanks so much. I'm glad you like them! Thanks for stopping by and leaving a sweet comment Leshia! I'm working on my "blog tag" post :) I'll let you know when it's up! Shannon this cracks me up because I can so relate! Great idea for no more dead plants! Lol! Pinning! Haha. Thanks Christina! I'm all linked up at your party and I've added it to my weekly party list. this is adorable, this i need. this i want! I LOVE these Shannon! What a cute idea! These are so great! I wish I knew I how to knit because my plants all die, too! I like finding out that I'm not the only one that kills plants! :) Thanks for stopping by. Thanks Emmy! I'm headed over to your blog now :) I'm glad you stopped by and I'm so glad you're following! I absolutely love these - too adorable!!! That is seriously brilliant! I absolutely love the idea! Oh my gosh these are cute! I don't knit though :/ Thanks for linking with me. Oh girl, you don't even know. I've killed so many plants I'm sure I'm on some kind of most wanted list ;) I'm so terrible, I'd probably find a way to kill even these! Super, super cute though!! These are the cutest coolest things!!! You did a great job on these, Shannon! What a fun idea! Oh man these are so great! You should post a pattern for them! Okay, so I want to make some of these this weekend. I have a question though. When you say you know the flat one in seed stitch around, do you mean you knit, like, a tube and then just sewed it together? no celkom pekne ti to ide! Two quick questions: for the flat cacti, did you stuff them? And did you knit them in the round or make a front and back and sew them together? Ok, one more: have you made any with arms? i want to add arms to one of mine, but am not too sure how to make them. I knit the flat cactus in the round. I didn't stuff it. I haven't made any with arms yet but have thought about doing so. I'm thinking I'd do them in multiple pieces and then stitch them together. P.s. I didn't have your email so I hope you see this! Shannon, I am almost done with one of these but I am wondering about the top, did you decrease the stitches like you would for a stocking cap, or did you just bind the top of the tube off and gather it? I would guess you decreased, but I am worried about keeping the ribs when going that route. Thanks for the idea! GENIUS!! I love this. 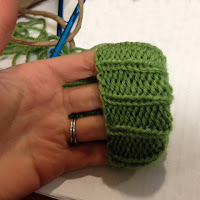 I'm pinning in case I ever learn to knit, because I have a black thumb, too. This is so much better! I'd love to knit a bunch of these as centerpieces! Such a great idea! Thank you! i have also killed cacti before. and say, did you use a circular knitting needle for that? i've never used one before, but it seems very useful to have one. I love these! I saw the link in the side bar and before I even started reading I thought - these are perfect they won't die like all the other plants (including cacti which I didn't think possible) ! I don't know what I do wrong but they don't last. These will though!